The truth is, most businesses grow up this way. Coordination and hand-offs between departments are managed with e-mails, voice mails or conversations in the lunch room. Data from the different systems is re-entered from one system to another, or is gathered in spreadsheets for job costing and reporting purposes and smart hard working employees catch mistakes before they cause real problems. As the company grows, this approach becomes significantly less efficient and more chaotic. Employees waste more time with duplicate efforts, re-entering the same data between systems, tracking down missing data and trying to decide what information is ‘the right’ information, because the quote or time sheets say one thing and the invoice says something different. Some things are too difficult to do manually, like tracking serial numbers or comparing detailed estimates to actuals in order to cycle implementation lessons learned back into the quoting process, so those things get done intermittently, or not at all, resulting in easter egg hunts when “something really bad happens” and the original data needs to get tracked down. This “Frankenstein’ed” disconnected software approach often leads to fire drills caused by incomplete, or out of date data being ineffectively passed from one department to the next, or worse yet, not being communicated at all. 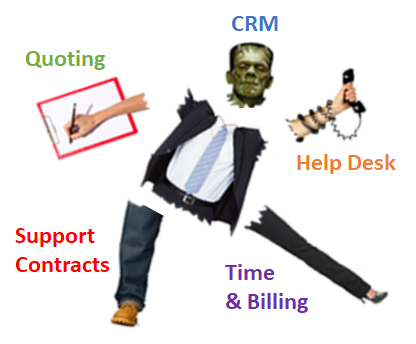 Left unchecked, Frankenstein’s business software monster will eventually consume your employees productivity, company profitability and put customer satisfaction at risk. The Problem: At the end of the installation process the Service delivery team needs notify the billing team of what’s been successfully delivered for products and services that are now ready for billing. Using e-mail, face to face meetings and voice mail to manually communicate part numbers, quantities, hours and pricing, or having to manually collect that data from multiple systems allows for a huge billing margin for error. This could result in invoices going to the customer for the wrong parts or services, in the wrong quantities and then having to credit and re-invoice the customer, which leads to unhappy customers and payment/cash flow delays. The Solution: If all previously entered data simply flowed from one step to the next (Quoting, Sales Order, Procurement, Service Delivery, Completed Work Assignments/Time Sheets, Invoicing) and if any changes were automatically visible to all affected departments, then the Services resources would simply “check-box” the delivered equipment, professional services, or support contract items (including partial quantities) that had been delivered and were ready to be billed and an automated notification (invoicing request) could be sent to the invoicing team, indicating the items ready to be invoiced. The invoice would then be created without having to re-key any of the line item information and e-mailed right out of the system directly to the customer. This would significantly reduce invoicing errors & delays and reduce the admin time wasted correcting mistakes. This should accelerate turn around for customer invoices and improve cash flow. 2) Sales and Order Fulfillment Disconnects: Dirty hands off between Sales and Order Fulfillment. The Problem: Manual hand-offs between the Sales and Order fulfillment teams often involves re-entering outdated Bill of Materials and labor estimate data from Word/Excel quotes into the Accounting software for procurement and invoicing purposes. Some items in the Word/Excel quotes may have become discontinued and pricing may be out of date (especially if the Excel/Word quote was based on a copy of an even earlier quote from a previous project or other customer). This often results in fulfillment mistakes that require rushed couriers, unplanned overtime, and/or wasted service time to correct. This can affect project profitability and whether projects are delivered on schedule, which affects company profitability and customer satisfaction. The Solution: The approved quote version (based on a current accurate master parts list & margins) should automatically transfer data to the order fulfillment module, including detailed Bill of Materials, labor estimate and support contract data. Profit/margin thresholds should require management approval if crossed, before the order is approved. Automated notifications could be sent notifying the Order fulfillment team that a new order had been approved and was ready for processing. This would ensure more consistent quote margins, eliminate fulfillment fire drills and lead to faster, more efficient and more profitable customer solution delivery. The Problem: Delayed, incomplete or inaccurate equipment/product delivery information is manually communicated between procurement and project managers or field techs’, which often leads to product/equipment being brought in too early, tying up valuable cash flow, or too late, causing inefficient scheduling of service technicians. This may result in rescheduling or return field technician visits, missed project start or completion dates, which leads to unhappy customers and delayed billing. The Solution: Order fulfillment, Project Managers, field tech’s, or scheduling coordinators, should all be able to see the delivery lifecycle for all product/equipment for a particular order in a single shared view, no matter which vendor the items were ordered from. With real-time visibility into whether items have been ordered, received, shipped or invoiced. This would eliminate the frequent manual communication between procurement, scheduling and service delivery resources, making all resources more efficient and productive. Changes, delays or back-orders would be immediately visible to all parties. This should make technicians more efficient and productive, improve customer satisfaction and speed up billing. The Problem: Now that the project has been completed, the customer needs to be supported. If the Help Desk can’t easily determine which customers have support contracts, or which products/equipment are under contract/warranty, they may accidentally provide what should have been billable support at no cost, or require invoices to be cancelled for billing that should have been covered under support contract. Unnecessary equipment replacement costs may also be incurred for products that were under warranty, but were never returned for warranty replacement. This could lead to reduced support contract profitability, customers delaying or canceling support contract renewals, Service Level Agreement violations, which could lead to company profitability and customer satisfaction issues. The Solution: When product/equipment is shipped to the customer it should automatically become part of customer inventory including serial numbers. Items under support contract/warranty should be visible to Help Desk technicians right in the support ticket, including Service Level Agreement response times for that item. Exchanges, returns, replacements or additions should automatically update the customer equipment list. This would ensure accurate customer support billing and allow the Help Desk to confirm billable/non-billable status in real time. This would also make it easier to provide the customer with an accurate asset list at time of support contract renewal, speeding the renewal process. All of this should result in higher customer satisfaction, reduce SLA violations and lead to more profitable service contracts. The sales forecast is critical for providing accurate visibility into expected revenue, planned procurement and labor requirements and ultimately drive informed growth investment decisions. Opportunity forecasting done in a disconnected CRM, or on whiteboard or spreadsheets, combined with quotes done in Word/Excel (or a 3rd party quoting tool), requires that sales reps manually update the opportunity forecast every time a quote revision with a different Bill of Materials and Labor Estimate (with different revenue and margin totals) is sent to the customer. With multiple reps, working multiple deals, each with multiple quote revisions, the likely hood of the sales forecast being accurate at any given time is pretty much zero. The Solution: The sales forecast should be hard-linked to the quoting system, with quote revisions automatically updating the sales forecast. A link at the detailed Bill of Materials and labor estimate level would allow the forecast to be consistently accurate and allow you to slice and dice the sales forecast by Sales rep, Opportunity, Customer, Line of Business, labor type, manufacturer, product type, etc. That kind of forecasting visibility would make revenue, procurement and labor planning much more effective and growth decision making more accurate. If any of these disconnects are causing fire drills within your organization, your business software may have become a full-grown “Frankenstein”. The disconnected business software that helped achieve your current level of success, may not be scalable enough to take your company to the next level and your “Frankenstein’ed” business software will eventually consume your employees productivity, company profitability and put customer satisfaction at risk. Find out what a “connected” CRM, Help Desk and PSA business software solution looks like by downloading the Promys PSA brochure today. Click here to Download the Promys “connected” CRM, Help Desk and PSA brochure now.